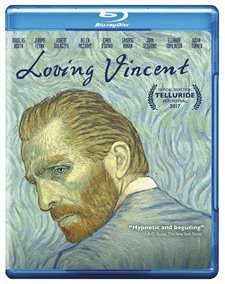 Download Loving Vincent in Digital HD from the iTunes store. Loving Vincent images are © BreakThru Productions. All Rights Reserved. Vincent Van Gogh is often considered the father of Modern Art. He is revered as one of the most influential painters and his legacy is one of respected artistry mixed with stories of his madness. While alive he was poor, drank heavily and was considered to be crazy. After his death, his life and work have been studied and examined over and over again by numerous entities and dissected time and time again. He was troubled by demons nobody will ever quite understand, yet despite that, or perhaps because of it, he created masterpieces that were only appreciated once he was gone. Loving Vincent is in some ways a love letter to the man who would create over 800 paintings in just eight years. The film begins one year after Vincent's death. Postman Joseph Roulin (Chris O'Dowd; Bridesmaids) asks his son, Armand (Douglas Booth; Pride and Prejudice and Zombies) to try and track down Vincent's Brother, Theo (Cezary Lukaszewicz; Strazacy), and deliver a letter Vincent wrote before he died. Reluctant, Armand begins his journey and meets Pere Tanguy (John Sessions; The Good Shepard) who informs him Theo Van Gogh is also dead and that Vincent had befriended Doctor Gachet (Jerome Flynn; Game of Thrones) who had been treating Vincent for his depression and who was there when Vincent died. As Armand discovers more and more about Vincent he wonders if the gunshot wound that killed him was actually self-inflicted. He speaks with other people in the town including the boatman (Aidan Turner; The Hobbit Trilogy), Dr. Gachet's daughter, Marguerite (Saoirse Ronan; Lady Bird), and housekeeper, Louise (Helen McCrory; Harry Potter and the Deathly Hallows Part I and II), and the proprietor of the boarding house where Vincent lived, Adeline (Eleanor Tomlinson; Jack the Giant Slayer). Through these individuals, he gets a more complete view of Vincent Van Gogh which makes him question much of what he previously heard and knew. The beauty of this film is the unique process used to create it. The filmmakers chose a brilliant way to make this movie stand out amongst a litany of other dramas. Once principal photography was complete, they then had a team of over 100 artists painstakingly hand paint each frame of each scene in the entire film – a process that had not been done before. The result is a stunning visual and an extraordinary product. 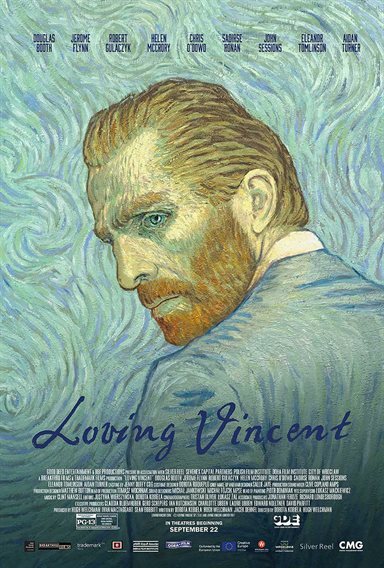 The whole film not only incorporates many of Van Gogh's most famous paintings but it actually looks like one of his paintings with thousands of brushstrokes per frame. The Blu-ray highlights these literal and figurative works of art with a 1080p high definition video quality and a 1.37:1 aspect ratio. Each brushstroke is highly detailed, though some of the black and white sequences lose some of the detail that the color frames seem to have. The DTS-HD Master Audio 5.1 is fine with this feature but since there is little background noise and even the dialogue is kept to a minimum there isn't much to enhance in terms of sound quality. The disc has a number of interesting extras including: The Making of Loving Vincent, Walking through Vincent's Neighborhood, Beginning the Animation, Creating the Props, Interview with Douglas Booth, Interview with Eleanor Tomlinson, 3 Paintings in 1, and the trailer. While several of these focus on the process of the paintings (deservedly so), I wish there would have been some footage of the live-action scenes before they were painted in order to offer the viewer a comparison. Loving Vincent is an unusual viewing experience that is not to be missed but which can also be a little distracting at times. It is also an interesting story that I wish would have been explored a bit further and developed more. However, it is definitely worth seeing at least once and maybe even more if you happen to be a fan of art and the great artist that was Van Gogh.